Why can't I get my form to appear on your secure server? I'm a new user. I created a Credit Card Authorization form that I want my users to access as a secure document on your secure server. As I test the link to the form in my email, I repeatedly get a message saying: "The server at secure.jotform.us is taking too long to respond." Am I doing something wrong? Or is there a problem with the secure server? P.S. The form is not embedded in a webpage. I simply want to send users a link to the form in an email. I cloned your form and it is working fine in my end. Please try to clear your browser cache and I will clear your form cache in our end. And please try it again. But when I use the https// link, I'm never able to get it to appear. I need to be able to use the secure version of the link because it is for credit card information. 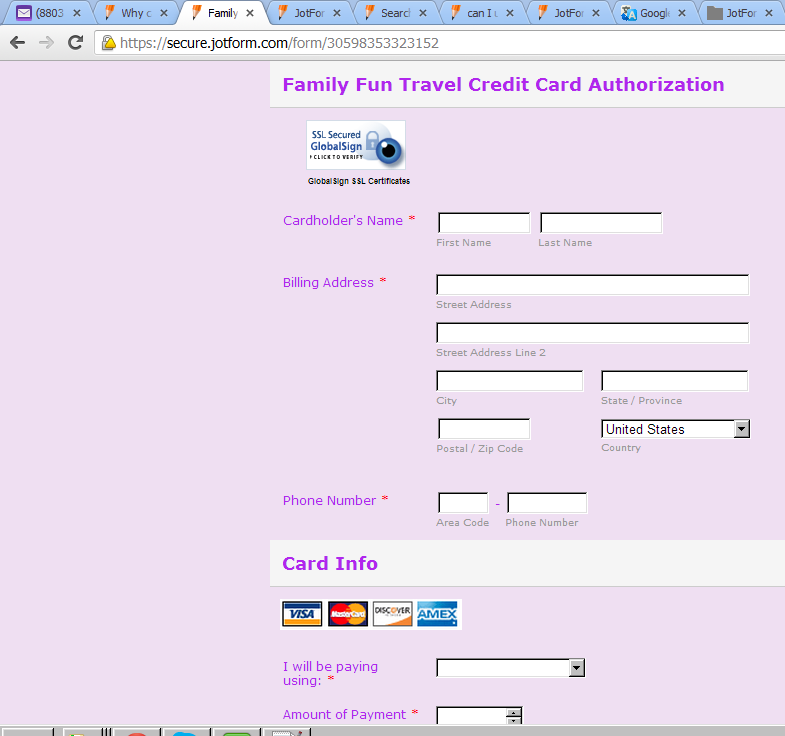 The form also takes a very long time to load to my FB tab, but it does eventually happen. Please try this https://secure.jotform.us/form/30598353323152 . Sorry. This new link does not work for me either. I do not believe it is a problem with my internet connection. I sent this link to 2 different friends of mine, and niether of them were able to to see the form. The same message appeared about "secure.jotform.us" taking too long to respond, or the screen just froze blank. Is there any other help you can offer? I'm wondering if I should create a new form so that I can get a new code/link that might work better? Sorry for inconvenience. Yes you can try creating new form but please try this link https://secure.jotform.com/form/30598353323152 first. I also made a screenshot of your form using the link. Please confirm if this is the form you are referring to. Alright! We are making progress. Yes, that is the correct form and the link provided above the screenshot did work for me for the first time. However, it took a long time to load - probably 30-45 seconds. Any thoughts on that? I'm glad the link seems to be working now. It would be great if it would appear quicker after clicking on the link. Do you have a lag time with it when you open from an email? I forwarded the email to 3 friends to test how it works for others. I'm glad to hear that. When I clicked it, it opens like normal webpages. I don't have lag time when opening it from mail. Cheers.